Ever wondered about accurate, ethical and common sense advice on finances and where it could be found? Surely not the government, right? Think again. 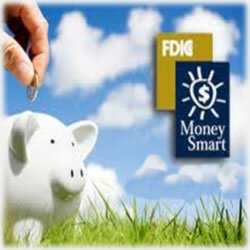 Since 2001, the FDIC has offered its Money Smart program. It’s introduced as “a comprehensive financial education curriculum designed to help low-and moderate-income individuals outside the financial mainstream enhance their financial skills and create positive banking relationships.” Sounds great, right? It gets better. There are specially created programs for adults, young adults (think: college), small businesses and others. Here’s where we found our surprise: Money Smart has reached over 2.75 million consumers since its inception. Who knew, right? Keep reading as we explore this avenue that many say flipped a switch, of sorts, and put them on the path of financial freedom. We’ve long since known what the research suggests: education and easy to follow curriculum can positively influence how we tackle our finances and the more we know, the better prepared we are in tough economical times. It can often mean the difference between sinking and swimming. We also know that proper education, via the right avenues, can affect not only an individual consumer, but his family and his community as well. The more we know, well, the more we know – and the more likely we are to stick to our savings plans, buy a new home and really secure a sound financial future. First up, you should know this program is available in a few formats – and they’re all free. The second format is another instructor led program for teens and young adults between the ages of 12 and 20. This is a fabulous tool for introducing today’s young people to the new rules of the game – and let’s face it, everything’s changed for many of us. The rules we were raised with are dated and, frankly, ineffective in our modern society: go to work each day, save as much as possible and your retirement will take care of you after your working years are over. The third format is described as a “a self-paced Computer-Based Instruction format online for ages 13 and over. It’s available in both English and Spanish. The fourth and final format is prepared in an MP3 version. The Money Smart Podcast Network is the host company and it’s as complete as its three counterparts. While consumers can take the initiative and treat this as a private exercise that they complete at their own pace, there are many banks, credit card companies and even classrooms that incorporate this federal government program. They sponsor financial education workshops in the classroom or other locations within their communities. In fact, FDIC encourages banks to work with citizens in the communities they serve so that they’re in the ideal position to deliver sound educational advice, the right financial services and help for those who might have struggled with credit problems in the past. Not only that, but many banks opt to fulfill part of their Community Reinvestment Act obligations via this program. The Community Reinvestment Act of 1977 (CRA) encourages federally insured banks to help meet the credit needs of their entire community, including areas of low-and moderate-income residents. As we mentioned, there’s a curriculum designed especially for young adults. It’s meant to teach the financial basics for those who are preparing for adulthood. Among some of the topics are “how to create positive relationships with financial institutions”, “understanding credit card interest rates” and “the basics of handing your money”. It’s all about empowering young people in their formative years with the basics of financial education. This can provide a solid foundation, based on knowledge, skills and confidence needed to effectively manage finances as they transition into the “real world”. The best part (aside from it being free) is that it’s designed to meet educational standards in every state. It’s newer than the initial “Money Smart” program, but because the initial program won awards and is held in high esteem, the young adults version is cut from the same cloth. Users can move through the program at their own pace and have free reign to customize as their needs emerge. There are no copyright restrictions, which makes it a great tool for schools and community organizations. Each module is approximately two hours, but the government created it in what it refers to as “layers” so that those modules can be further broken down into more manageable time spans. Students learn how to pay themselves first, how to open a checking account, how to manage a credit card account and much more. As students complete each scenario, they are evaluating current knowledge or knowledge learned through the instructional materials and classroom activities. There are no right or wrong answers; students choose the best answer and then see how that decision has affected the characters’ financial status. Each scenario takes approximately 10 minutes to complete. If you wish to learn more about the FDIC program, visit FDIC.gov.